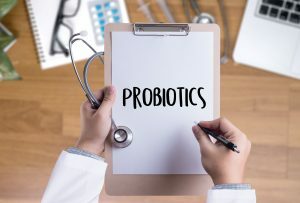 In this article, you’ll learn how probiotics can prevent some of the negative side effects of antibiotics and keep your gut healthy. You’ll discover the best probiotic supplements on the market for antibiotic-associated diarrhea and other digestive problems, as well as what probiotic foods to eat. What are Antibiotics Used For? Antibiotics are a class of drugs that kill bacteria. They are used for harmful infections in or on the body. Common antibiotics include clindamycin and amoxicillin, though there are many different types of antibiotics on the market. Antibiotics work by either directly killing bacteria or preventing them from replicating or reproducing, thus dwindling bacteria numbers over time. Antibiotic drugs only kill off bacterial infections in the body, which means that they aren’t useful for illnesses like the common cold or the flu, for example, because these are viral illnesses. Luckily, many of the digestive problems that are caused by antibiotics can be helped by probiotic supplementation. We’ll go over that in just a minute, but hold tight — there are a few other common side effects of antibiotics that we’ll cover first. Clostridium difficile is an infection that causes diarrhea and inflammation of the colon. It is associated with recent antibiotic use and being in a healthcare setting. Common antibiotics that are associated with c.diff infection include clindamycin and fluoroquinolones (such as ciprofloxacin (Cipro), gemifloxacin (Factive), and levofloxacin (Levaquin), among others). While it’s easy to see how antibiotics can cause digestive upset or even serious infections like c.diff, you may not realize that taking antibiotics actually causes negative shifts in your microbiome (the bacteria in your gut). Your microbiome responsible for a number of tasks in keeping you healthy, including aiding in digestion, nutrient production, immune response and more. This negative bacterial shift leads to a condition called “dysbiosis” — essentially, an imbalance in the proper amounts of good and bad bacteria in your gut. Dysbiosis can lead to digestive problems like bloating, excessive gas, reflux, constipation, and diarrhea, but it is also associated with a host of chronic diseases as well. If you’d like to know more about dysbiosis and the chronic diseases it is associated with, make sure to check out my article on the topic here. Clindamycin, one of the antibiotics I mentioned above, has been shown to cause unfavorable changes in healthy gut flora even two years after treatment. (2) Clindamycin also has a lot of unpleasant side effects including gastritis, gas and bloating, diarrhea and can lead to C.diff infections, as I mentioned before. (3) For more examples of how specific antibiotics affect the gut microbiota and their related side-effects, check out this research article. Clindamycin is by far one of the worst antibiotics in terms of unfavorable bacterial changes, but it’s wise to take a look at the research on the effects of any antibiotic you’re thinking of taking. While we know there are risks to taking antibiotics, the reality is sometimes we need them. The point of this article is not to discuss antibiotic alternatives like natural antibiotics (though that’s certainly an important discussion); rather, it is to give you advice on what probiotics are useful in reducing the side effects of antibiotics. Antibiotic resistance happens when bacteria are able to resist the effects of an antibiotic. Not good! When we take an antibiotic we want it to work, right? When bacteria start to become resistant it means that things that were once easily curable with antibiotics may no longer be killed off by these same drugs. When antibiotics are overprescribed and overused, this can (over time) cause antibiotic resistance. There will always be a few bacteria that are resistant to an antibiotic that you take. After you’ve finished your course, any bacteria that remains are those that are resistant to the drug. They are now allowed to grow freely and you’re no longer protected by your microbiome’s good bacteria. The more you take antibiotics, the stronger those resistant bacteria get. Now this isn’t to say that you shouldn’t take antibiotics when they are prescribed to you. Antibiotics are life-saving drugs, after all. But it means that you should have a frank conversation with your healthcare provider about whether antibiotics are necessary (some doctors are still prescribing antibiotics (often because the patient asks for them) for illnesses like the common cold, which is not affected by antibiotics since it’s a virus). Probiotics are live microorganisms that have a beneficial effect on the host (that’s you!). Your microbiome contains tons of probiotics and you can also consume probiotics exogenously through the use of probiotic supplements or probiotic-rich foods. Probiotics have a whole range of benefits. They improve the side effects of antibiotics (like diarrhea), which we’ll discuss shortly. But in addition to this, probiotics have been shown to be useful for a wide array of health conditions. The common side effect of probiotics is increased digestive discomfort, such as bloating or gas. This is typically short-lived and resolves in a few days of regularly consuming probiotic supplements or probiotic foods. More serious side effects are possible, but extremely rare. The bacteria or yeast that is consumed as a probiotic supplement can enter the bloodstream and cause infection. Those who are at increased risk of infection include immunocompromised patients, premature infants, those with short bowel syndrome, anyone with central venous catheters, and patients with cardiac valve disease. It is, of course, important to discuss any supplementation with your healthcare provider. There are many probiotic supplements on the market, so how do you know which one to choose? Well, the right probiotic to choose depends on what you’d like it to do. Probiotic effects are strain-specific, meaning that different strains have different effects on the body. If you want to reduce anxiety you could take a strain called Bifidobacterium longum R0175, while this strain may not be as effective if you wanted to prevent c.diff infection. So as you can see, it’s important to choose the right probiotic strain for the job! The answer is that probiotic supplements during antibiotic treatment has been shown to reduce the severity of antibiotic-associated diarrhea. (4) So even though your antibiotics might kill off some of those good gut bacteria, probiotics still reduce the negative side effects of antibiotics. Here’s a list of the most researched and effective probiotic supplements for reducing the incidence and severity of antibiotic-associated diarrhea. These are some of the best probiotic supplements on the market. Saccharomyces boulardii biocodex (now called Saccharomyces boulardii CNCM I-745) is found in the Florastor brand probiotic and helps to prevent C.diff infections (5) and even helps those who tend to have recurrent C.diff infections. (6). This strain does not need to be refrigerated, so it’s very easy to buy saccharomyces boulardii online. Lactobacillus rhamnosus GG (found in the Culturelle supplement) has been shown to reduce the occurrence of antibiotic-associated diarrhea, as well. (8) Like Florastor, it’s easy to buy Culturelle online since it does not need to be refrigerated. Antibiotics also tend to cause an overgrowth in yeast (particularly candida albicans). In a study on patients provided probiotic supplementation with Lactobacillus acidophilus CUL60 and CUL21 and two species of Bifidobacterium spp., those who supplemented probiotics along with antibiotics showed less of an increase in yeasts compared to the placebo group. (9) S.boulardii, mentioned above, has been shown to help prevent some of the virulence factors related to C. albicans. (10) I have not seen any research to date on the effects of VSL #3 or Lactobacillus GG on C.albicans or other yeasts, but please chime in in the comments section if you are aware of any. From the research, I think any of these probiotics are a good choice while taking antibiotics, but it is likely that S. boulardii has a slight advantage in that helps to deal with the overgrowth of yeast that is common with antibiotic treatment. 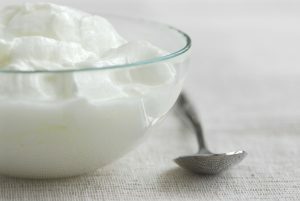 However, research has shown that other probiotic strains can be helpful in this regard as well, so it is likely that VSL#3 and Lactobacillus can be useful in keeping yeast counts down also. It’s not necessary to take all of these probiotics (it would be pretty expensive! ), though I doubt it would hurt you in any way. If you can’t find any of these probiotics, I still think you’re better off taking any probiotic that is available to you. 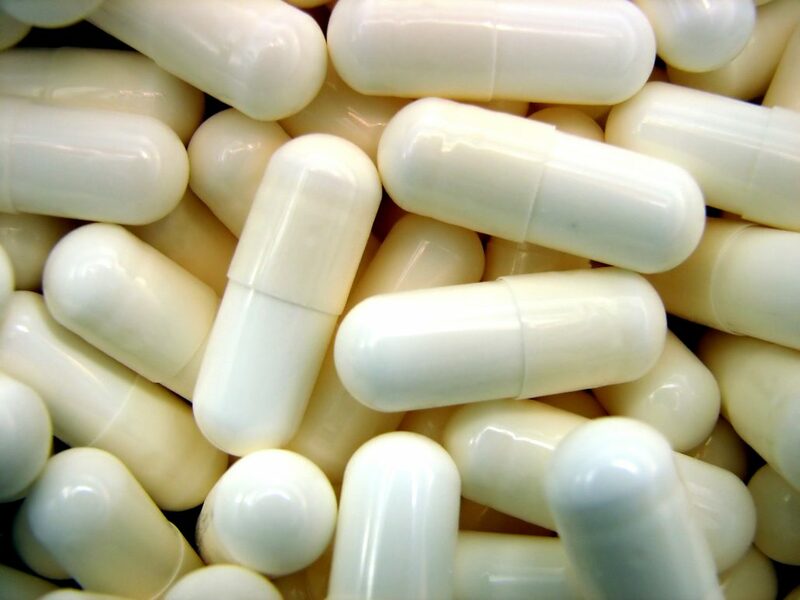 Though there may not have been research on the particular strains contained in your supplement (and probiotic effects are strain-specific), it is likely that probiotics in general are helpful in preventing some of the unfortunate side effects of antibiotic treatment. Eating probiotic-rich foods can also be useful in preventing the negative side effects of antibiotics. In addition to buying probiotic foods at the grocery store, you can also make your own! They are very simple to make, and you can even buy starter cultures online to make the process easier. Check out Thrive Market who sells some of these starter cultures (in addition to tons of really healthy foods delivered straight to your door). I recommend taking both a probiotic supplement and consuming probiotic foods while you’re on antibiotics. As you can see, probiotics are a powerhouse when it comes to preventing the negative side effects of antibiotics. 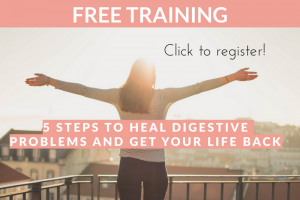 Ready to learn more about healing your gut? Watch my FREE training by clicking the image below! Once you’ve finished your antibiotic course, you’ve got some damage control to do. Antibiotics certainly take a toll on the gut, so it’s important to continue babying your gut after you’re done. Read my next article, How to Heal Your Gut After Antibiotics to learn how to do just that!